On the East coast this week temperatures are hitting the 100’s. Not only is it extremely hot but the humidity is real high. There are already heat warnings for people to stay inside due to breathing problems people might have in these weather conditions. Dogs are just as prone to having breathing problems in this heat and risk over heating. 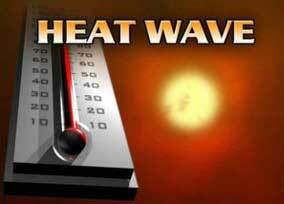 While it is this hot you should only let your dogs out for short periods of time 15-30 minutes. Plenty of shade is preferable. If you feel your dog has gotten to hot simple ways of cooling them down is misting them with a hose. Putting ice on their pads or ears. Also rubbing alcohol on their pads works great also. The evaporation rate of the alcohol is what makes it such a great cooling technique. I am sure looking forward to cooler weather.